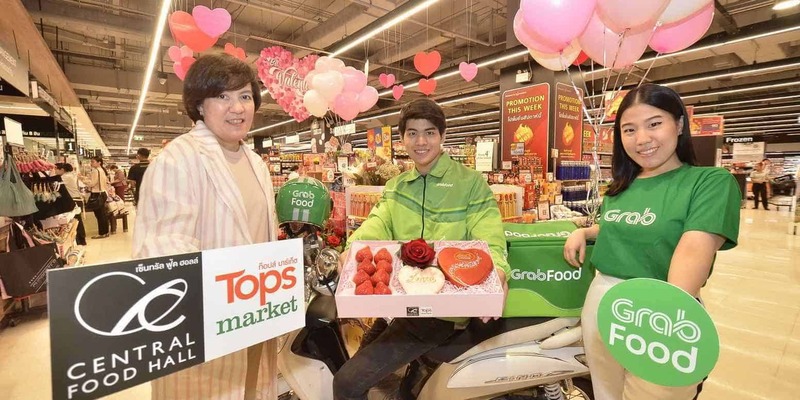 Ms. Maytinee Phisutsinthop, EVP – Fresh Buying and Merchandising of Central Food Retail Company Limited, and Ms. Chantsuda Thananitayaudom, Country Marketing Head, Grab Thailand, jointly launched Chocolate Love Delivery by GrabFood x Tops Campaign. Through GrabFood Service in the Grab Application, customers can place an order for top-hit chocolate items and get exclusive gift sets from Tops during the Valentine festival. This newly introduced Online to Offline Platform service is collaboration between Tops and GrabFood. The platform will accommodate the rapidly changing demands and lifestyles of consumers in the digital world and offer the convenience of service to them. Under this scheme, Tops has designed specially selected chocolate items and exclusive gift sets for the upcoming Valentine festival—including Chocolate Especially For You for Baht 999 and Chocolate Love Gift Set for Baht 599. Customers may purchase the items through GrabFood Service for their loved ones. Six customers who got the highest purchase value of these exclusive gift sets (minimum Baht 1,998 per order) will receive BNK48 Cards. This special arrangement is a part of sharing happiness with our customers during the Valentine festival.